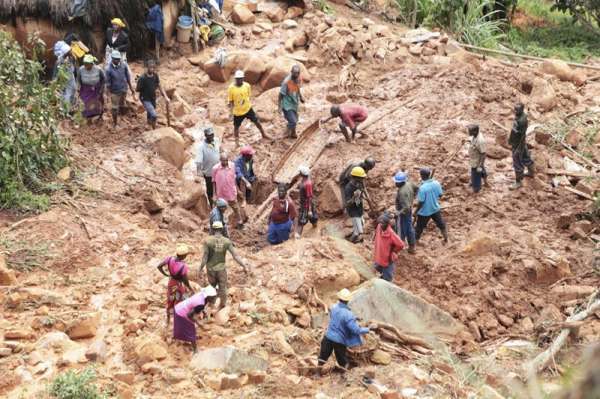 NEW YORK-- International aid has started trickling into the east African countries of Mozambique, Zimbabwe and Malawi to ease the humanitarian crisis created by floodwaters from Cyclone Idai. Relief efforts that were initially stifled by airport closures slowly gained steam Tuesday, and foreign governments began pledging aid to help the region recover from the worst flooding in decades. "Everyone is doubling, tripling, quadrupling whatever they were planning," said Caroline Haga of the Red Cross in Beira, Mozambique, referring to supplies and aid workers. "It's much larger than anyone could ever anticipate." The European Union released 3.5 million euros ($3.9 million) in emergency aid, and the United Kingdom pledged up to 6 million pounds ($7.9 million). Neighboring Tanzania's military airlifted 238 tons of food and medicine. Matthew Pickard of the humanitarian organization CARE said the response to Idai has been similar to prior natural disasters. Local authorities and international non-governmental organizations worked their way to the area in the first days, with additional aid destined to arrive soon after. The slow-moving catastrophe of the flooding and the inability to access some of the hardest-hit areas has limited the ability of some to see the scale of the cyclone. But, Pickard said, as those details become clearer, aid will spike. "Over the next few days we'll learn just how big it is," he said by phone from Lilongwe, Malawi. "These are countries that are not usually making headlines and they're making headlines. With the story comes people's intent to respond empathetically." Sacha Myers of the nonprofit Save the Children, speaking from Maputo, Mozambique, described rising floodwaters, "rivers and dams bursting their banks" and a death toll in the hundreds that was destined to climb. "We're having an unfolding crisis that's getting worse and worse," she said. The United Nations was deploying resources too, deputy spokesman Farhan Haq said, but logistics remained challenging and the hardest hit areas, including Chimanimani, Zimbabwe, remained inaccessible. As better data emerges from the disaster zone, donors will be standing by to make money and other resources such as medicine available, said Dr. E. Anne Peterson of the nonprofit health organization Americares. "It's early and a really big disaster gets attention fast, and the more media covers it, the more people realize there is a need and the more likely we are to see them getting engaged," she said. Ilan Noy, chair in the economics of disasters at Victoria University of Wellington, New Zealand, said aid was likely to flow from dozens of countries to the African nations. How much is pledged and when, he said, correlates to the media coverage a given disaster gets, not to mention factors such as the geostrategic interests and previous colonial ties of an affected country. Ultimately, the dollar figures that are announced can bear little meaning, with the numbers typically stand-ins for the value of salaries and supplies sent overseas.